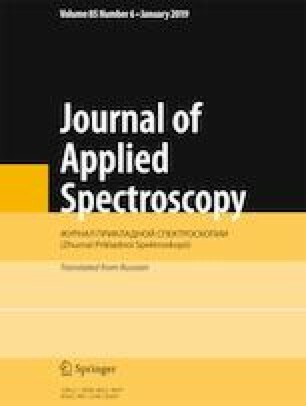 Changes in the concentrations of ordinary radiation defects and formation of near-cluster radiation defects (color centers) are shown to occur in nanocrystals fabricated by mechanical fragmentation of irradiated LiF crystals. Concentrations of near-cluster color centers increase to a steady value after fragmentation and remain constant at room temperature for a long time. UV irradiation of fabricated nanocrystals after termination of center formation processes in them causes the concentration of near-cluster defects containing three anion vacancies and two electrons to increase significantly. It is demonstrated that there are single-vacancy color centers as well as ordinary and near-cluster aggregate centers in unirradiated nanocrystals fabricated by fragmentation of unirradiated crystals. Translated from Zhurnal Prikladnoi Spektroskopii, Vol. 86, No. 1, pp. 71–77, January–February, 2019.